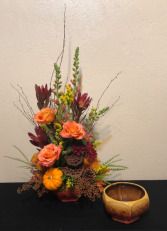 The large centerpiece can be made in an oblong or round style to fit the table. 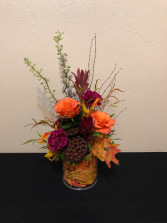 It features Sunset Asiatic Lilies, Free Spirit Roses, Lotus Pods, mini pumpkins and Millet accented by yellow and orange mums, Pine Cones and yellow filler. 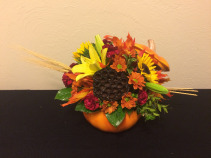 Please call (208)323-7738 for details and how to customize your order! Send your loved ones this designer's premium centerpiece. 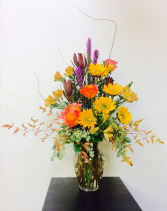 Decked out with bittersweet orange candles, lotus pods, pinecones, fall mums and beautiful Free Spirit roses. 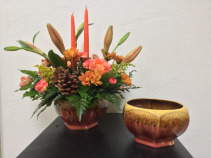 Wonderful for the Thanksgiving family gathering. 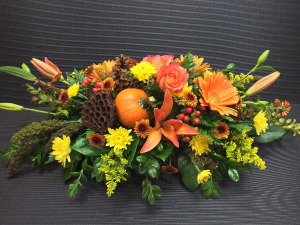 A cornucopia bursting with preserved leaves, lotus pods, mini pumpkins, orange roses, orange mini carnations, hypericum berries and sunflowers. Call the shop at (208)323-7738 to customize your order! This oblong Candle centerpiece has sunflowers, red hypericum berry, orange mums, pastel yellow mini carnations accented with spray roses, preserved oak leaves and pine cones. 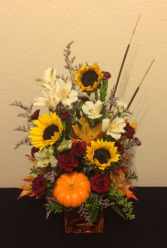 Call (208)323-7738 to customize your order! This oven and dishwasher safe ceramic casserole dish features a beautiful arrangement with lotus pods, orange roses, orange snapdragons, leucadendron, solidaster and fall mums, accented by a mini pumpkin, pinecones, preserved oak leaves and birch branch. 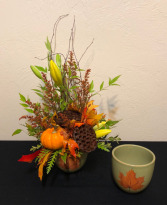 *This arrangement is created with seasonal products that may not be available at time of purchase. Call the shop at (208)323-7738 to hear what fresh product we can substitute with or to customize your order! This keepsake ceramic bowl feaures a fall leaf decal with a pumpkin, lotus pods, yellow lilies, birch branch, preserved oak leaves, bronze solidaster and accented by a mix of unique greenery. 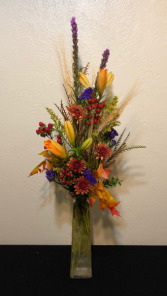 *This arrangement contains seasonal items that may not be available at time of purchase. 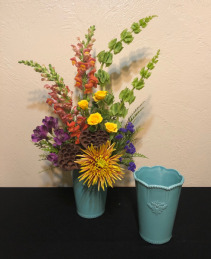 Call the shop at (208)323-7738 to customize your order and get more details! This keepsake ceramic casserole dish is oven and dishwasher safe. 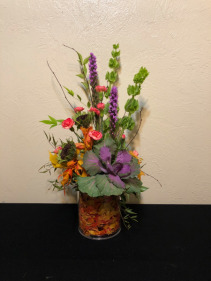 It features an arrangement with sunflowers, viking mums, burgundy mini carnations, purple statice and accented by solidaster, preserved oak leaves, lotus pods and pinecones. 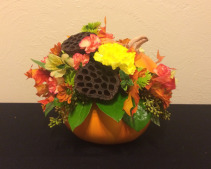 This unique round centerpiece is created in custom glazed kitchen bakeware. 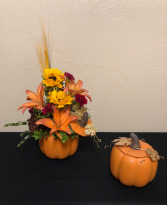 This warm centerpiece will continue to bring smiles for years with the keepsake filled with orange lilies, orange roses, orange mini carnations and orange daisies. Call (208)323-7738 to customize your order! **This item contains specialty items and vases that may not be available at the time of ordering. Call for more details.